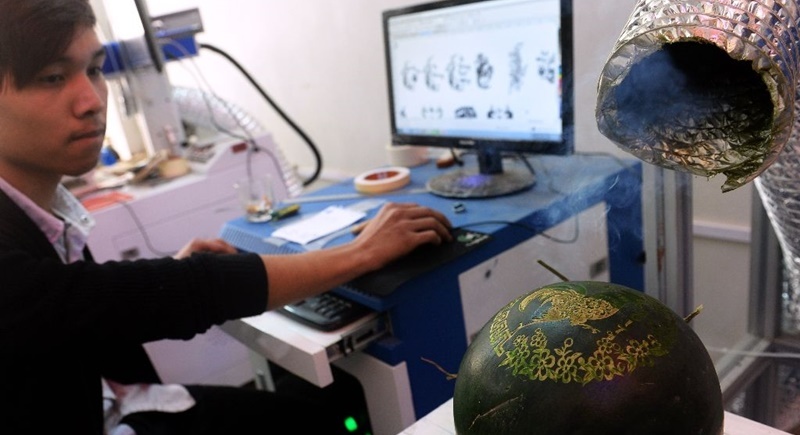 VIETNAM: After learning to use a laser engraving machine in a Vietnamese engineering school, Nguyen Van Minh is now putting the technology to an unexpected use: decorating fruit. It is a modern twist on the traditional custom of hand-carving designs into watermelons on the occasion of the lunar new year, a holiday known as Tet in Vietnam that kicked off on January 28. “Laser carving is more accurate and better for small patterns. Plus, the designs are more diverse,” the 27-year-old entrepreneur said as a laser beam rapidly etched an elaborate rooster design into the green rind of a bowling ball-sized melon. From giant pomelos to gold-dusted coconuts, Vietnam’s markets fill up with an array of novelty fruits ahead of Tet. The designer produce is often gifted to colleagues and relatives, or kept at home as decorations. Minh’s Hanoi-based company is now churning out scores of decorated and polished melons at a fraction of the speed that it takes traditional carvers to chisel away at the fruit's peel by hand. In the Chinese zodiac’s Year of the Rooster, the bird is without a doubt this season’s must have emblem. Other popular designs include dragons, phoenixes and messages wishing good fortune or wealth. Yet at about $1.50 (B52) to $3.50 (B123) a pop, Minh says his company has yet to be graced by riches. “Our profits are not good, but we still want to do it because this is a new business, and also because we’re passionate about it,” he said. As far as wishes for the new year, Minh says he only has one: a fruitful business.